You just can’t count out the San Antonio Spurs. They are among the most unheralded and under appreciated champions in recent memory in any sport. They’ve been called boring with hardly any excitement to them. No one thought to say in those criticisms that there wasn’t any excitement by comparison when teams weren’t dunking the ball so much, but yet someone had to be crowned the champion. I get that they aren’t the flashiest team or have the most personable head coach in Gregg Popovich, but they have been a determined contender for over a decade. Their level of consistency has been unmatched. The last time they missed the playoffs was 1997. The reason why they haven’t missed the playoffs in such a long period of time has been due to one person. Tim Duncan. 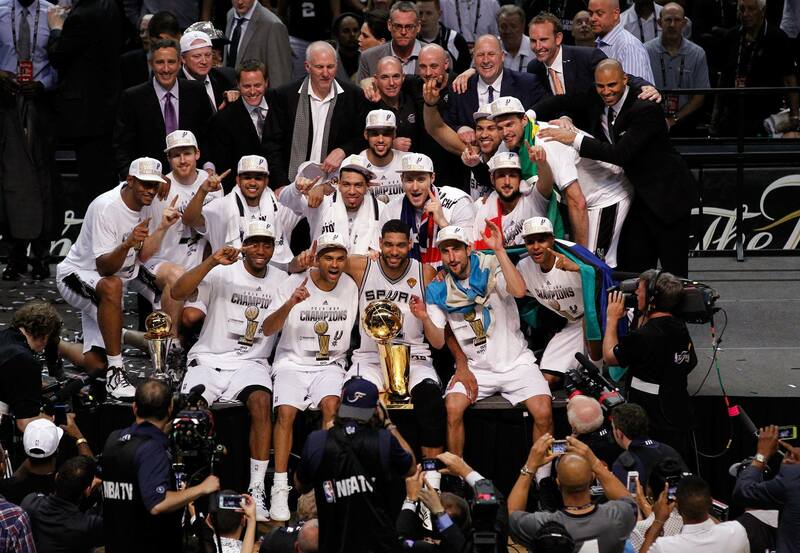 He has been the building block to five championships and with added pieces of Tony Parker, Manu Ginobili along the way continued their amazing success. Finals MVP Kawhi Leonard is becoming an elite player. He is falling into that Spurs mold of quiet success, but enough folks know that he is the real deal. When he can outperform LeBron James that is saying something. San Antonio knew that Miami wasn’t going to give them the title, but the Spurs wanted to send a message immediately and did from the start of Game 1. In the Spurs 5 game series victory all of their wins were by a margin of at least 15 points. That’s insane to think a team that has been to four straight NBA Finals in Miami could be thumped so badly. This shouldn’t surprise anyone that San Antonio was able to overwhelm their opponent. This has been their philosophy under Popovich. Great ball movement with precision shooting. Hardly any careless possessions and their defense has been among the best every year. Questions are flying about whether Duncan and Ginobili will return or decide to call it a career, but all that is being put off for now. If they do decide to return there is no doubt they will be a favorite to win the title. Regardless of what many of the top players in the league decide to do during the free agency period the Spurs won’t dabble in any of that. They will draft wisely and shore up their own free agents for another run at a sixth championship. This entry was posted in Basketball and tagged NBA, Spurs, The Finals.